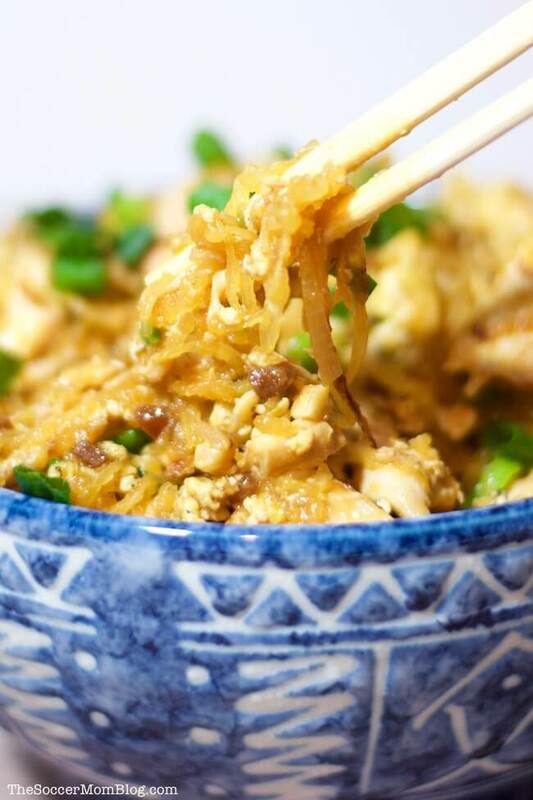 This easy Chicken Pad Thai recipe is everything! 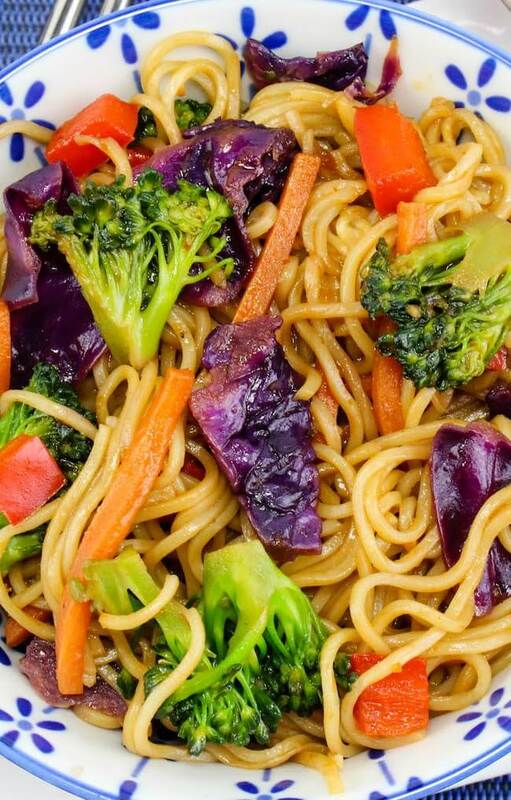 Tastes just like takeout — and ready at home in 30 minutes! 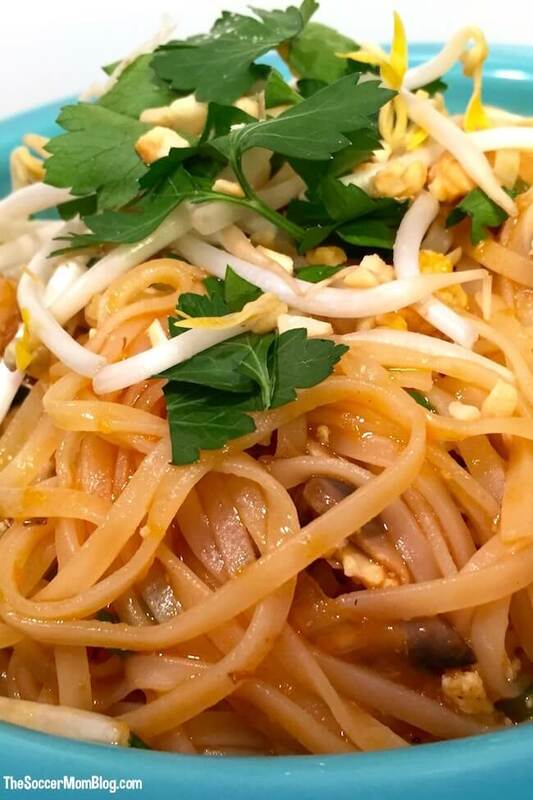 Pad Thai is one of my favorite meals— in fact, in was one of the only foods I could tolerate while pregnant. 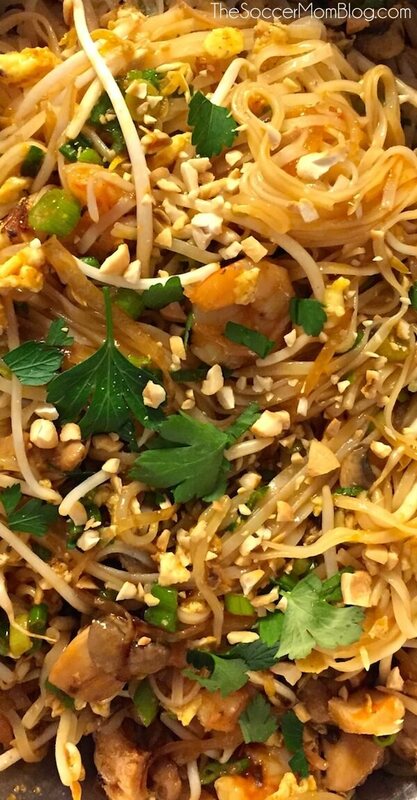 Since our go-to Thai restaurant is a little out of the way, my husband (the chef in the family) created his own version that can totally stand up to take-out. Pre-made sauce shortens time spent in the kitchen as well as your shopping list, but be sure to combine with fresh veggies and protein for the best flavor. This recipe is simpler than you might expect — it’s mostly prep (cutting, chopping, etc) and then putting together the ingredients. 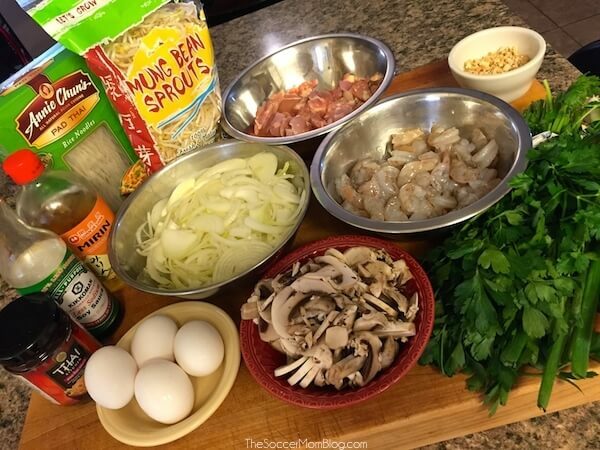 You can use one sauté pan to cook everything aside from the noodles. 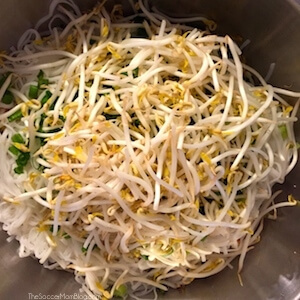 Related: Try our “famous” Sweet Soy Asian Brussels Sprouts! 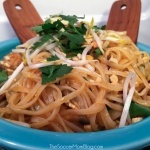 Free printable copy of this Chicken Pad Thai recipe available at bottom of post. 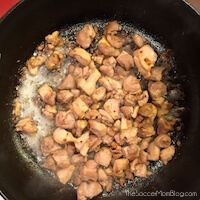 Sauté chicken (use the same pan in which you cooked the onions) with soy sauce and mirin. 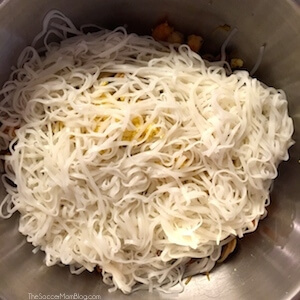 When chicken is partially cooked, add shrimp, 1 cup of mung bean sprouts (they will cook down — this is a great way to hide more veggies for the kids), and mushrooms. 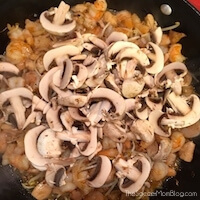 When mushrooms start to soften, remove all ingredients from pan and add to large mixing bowl with the sautéed onions. Scramble eggs and add to mixing bowl. 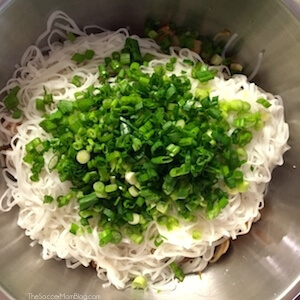 Add noodles, green onions, remaining cup of mung bean sprouts, and sauce. Stir until ingredients are well-combined. Add cilantro and nuts to garnish. That’s it — easy right? Saute onions until caramelized. Set aside in large mixing bowl. Saute chicken (may use the same pan in which you cooked the onions) with soy sauce and mirin. 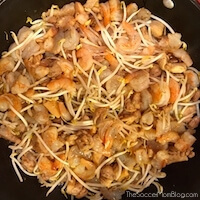 When chicken is partially cooked, add shrimp, 1 cup of mung bean sprouts (they will cook down-- this is a great way to hide more veggies for the kids), and mushrooms. 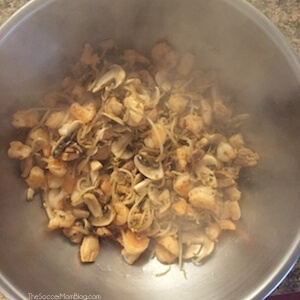 When mushrooms start to soften, remove all ingredients from pan and add to large mixing bowl with the sautéed onions. 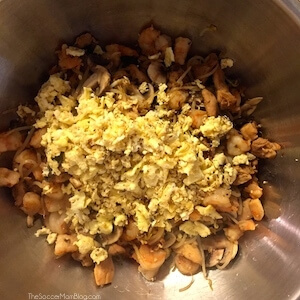 Scramble eggs and add to mixing bowl. 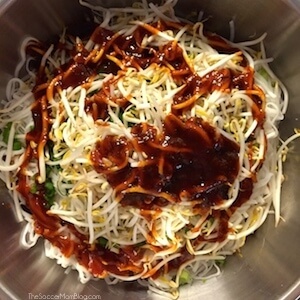 Add cilantro and nuts to garnish. 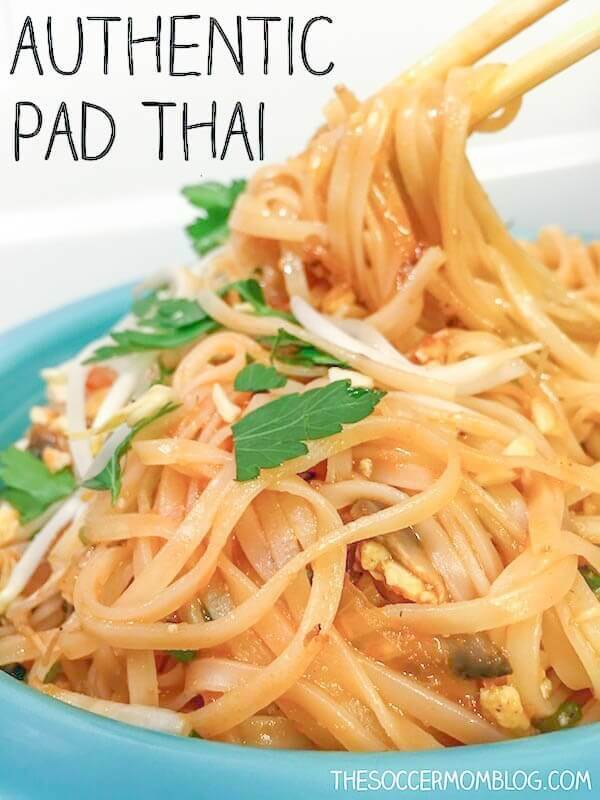 Omg I love pad thai!! Reblogging to my page so I can try this out! What is the nutritional information for one serving? Hi April, I’m not really able to give an exact number, because what is considered a serving can vary from person to person. I’m a home cook, so that is why I don’t have that information on the recipes — I wouldn’t want to give any misinformation. I would do a web search for a site that can help you figure nutritional estimates on your meals. I think there are sites that allow you to plug in the amounts and ingredients you consumed and provide an estimated nutritional information listing.